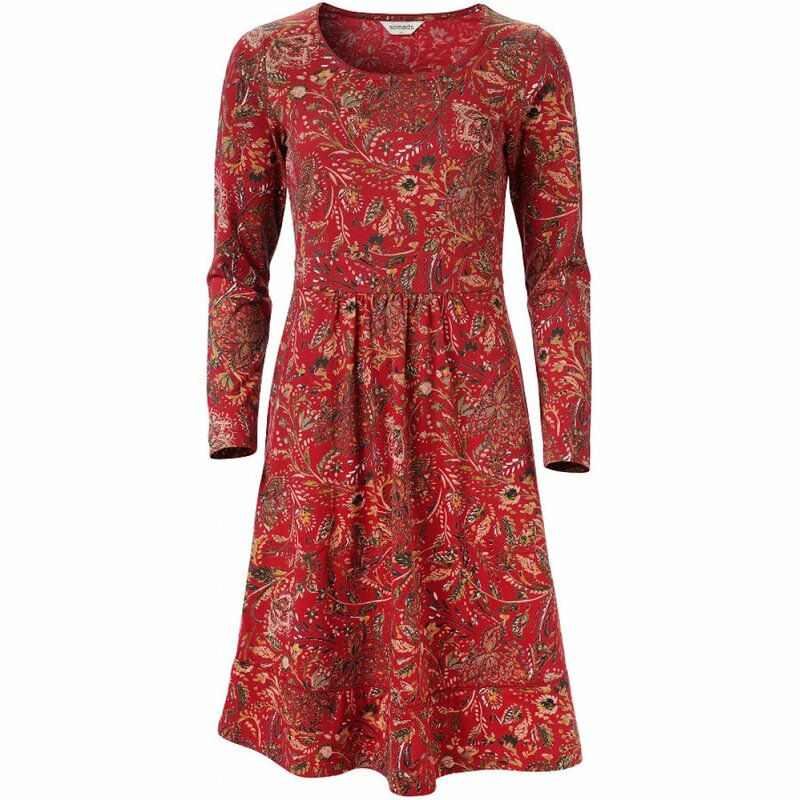 Made from beautifully soft organic cotton jersey, this fair trade long sleeved flared dress features a fitted waist for a flattering figure. With an elasticated panel at the back for extra comfort along with hidden side pockets and front pleat detail. Pair with cosy tights for an office to night look. Suitable for vegans and made with azo-free dyes. The Nomads Amara Jersey Flared Dress product ethics are indicated below. To learn more about these product ethics and to see related products, follow the links below. A lovely dress. The print is very pretty. I have worn it with thick tights and boots in winter, and have been very pleased with it. 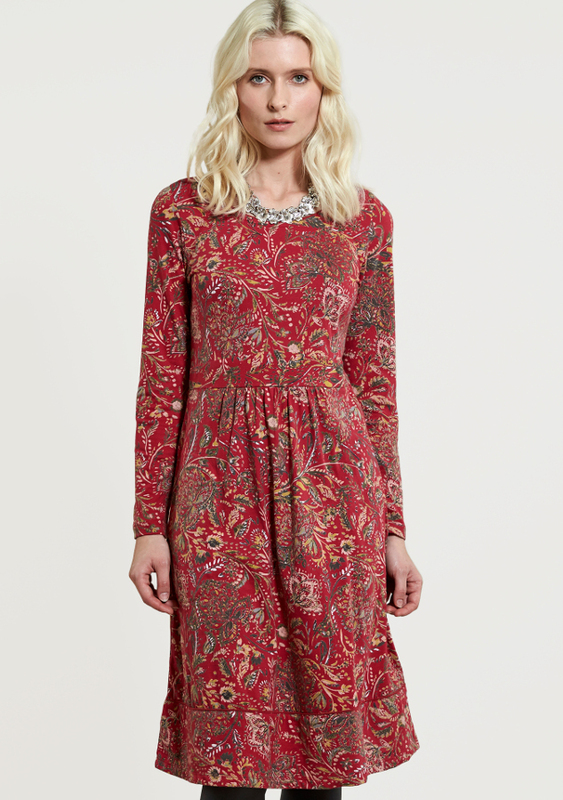 A lovely dress for autumn and winter, colourful without being over the top. The dress drapes well and falls below the knee (I'm 5ft 8"). I sometimes take a size 14 and sometimes a size 16 in Nomads dresses. Because the bodice is fitted, the size 16 is ideal. 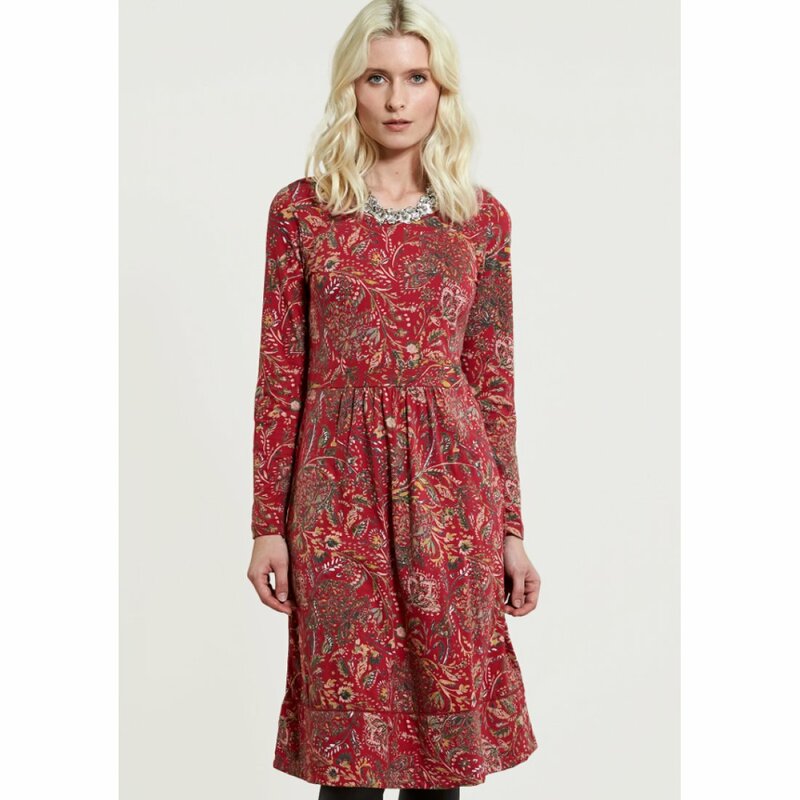 There are currently no questions to display about Nomads Amara Jersey Flared Dress. Nomads Clothing create high-quality, fair trade clothing, from ethnic tie-dye to floating kaftans and dresses. Founded by Duncan and Vicky in the late 1980s, Nomads clothing is inspired by the founders love for India, its culture, colour, patterns and prints. Nomads regularly travel back to India to discuss new ranges and gather inspiration and continue to maintain the ideals of fair trade business throughout the company, from relationships with suppliers in India and with customers back home in the UK.